ADHD can be very stressful for families and for teachers. Although many of those diagnosed with ADHD are highly intelligent, parents worry whether or not their child will be able to cope successfully with future jobs and family life. A parent's worse nightmare might be having their ADHD child living at home with them in their 30's, not being able to hold onto a good job or vocation. 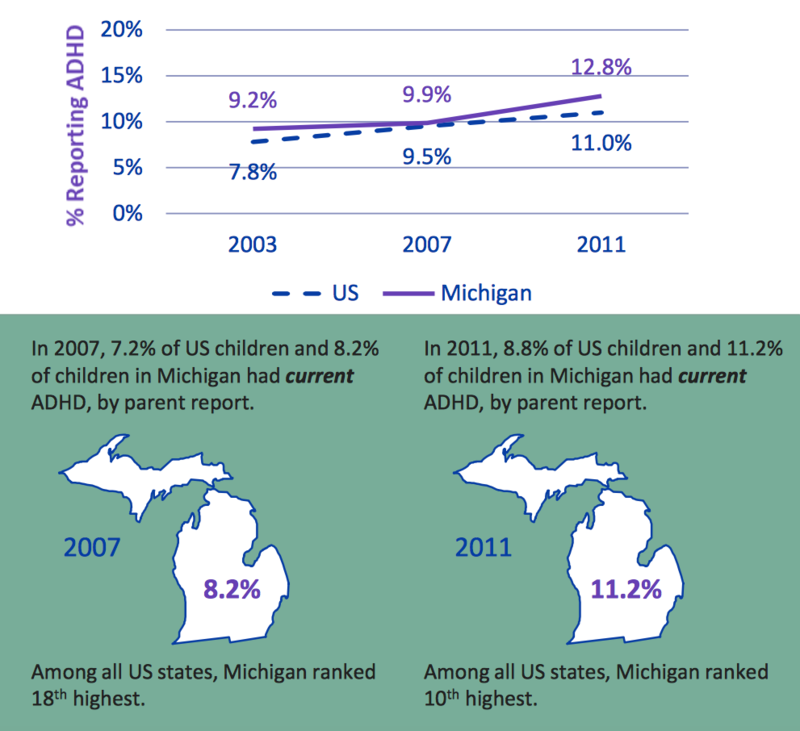 One sobering statistic is a diagnosis of ADD or ADHD are the number one reason children are medicated in the United States. The children of the United States consume three times the quantity of stimulants consumed by the rest of the world’s children combined. With a diagnosis of ADHD there are often a lot of misunderstandings. Some say it is not real. Some say it is due to parenting. Some say teachers aren’t handling the kids appropriately. Evidence points to ADHD being very real and being a result of imbalances in the brain’s chemistry and neuronal (electrical) integrity. The good news is there is hope…and it doesn’t have to be medications! With ADHD there tend to be imbalances in the way the brain is firing. When certain areas of the brain fail to develop as quickly or efficiently as other areas it can result in a neurological imbalance that can lead to many of the trademark symptoms of ADHD like inattentiveness, impulsivity, hyperactivity, etc. For example, the pre-frontal cortex of the brain plays a vital role in regulating focus. If the frontal lobe is not as strong as it should be it often results in ADHD like symptoms. The good news is the brain can be changed (exercised and strengthened) like a muscle. It also can be fed the special nutrients it needs to function at its peak. Read on for more details on what action steps you can take to get help for you or your childs' ADHD without resorting to medication. 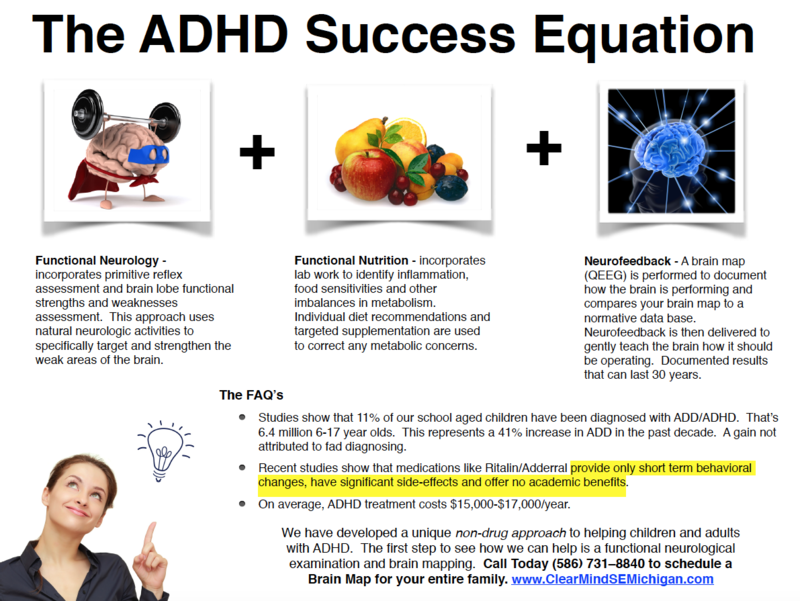 When it comes to effective management of ADD and ADHD in children and adults, having the facts about various options to solve the underlying causative factors is paramount. When you consider that all medications carry the risk of side effects, which at worst, can be fatal and can lead to addiction or abuse, doesn’t it make sense to explore the highly viable neurofeedback option for your child or yourself? Read on for some eye-opening facts and statistics. It is believed that over 50% of children diagnosed with ADD meet diagnostic criteria for other psychiatric disorders such as mood, anxiety, substance abuse, learning disorders or behavior disorders (Gartner et al., 1997; Gzaziuddin et al., 1998; Gralton et al., 1998; Bonde, 2000; Dykens, 2000; Kadesjo and Gillberg, 2000). A large portion of those with ADHD will be arrested for felonies. University of Southern California researchers found that kids with low arousal (low beta brain wave magnitude) had a greater chance of becoming delinquents. The majority of inmates’ first diagnosis was ADD/ADHD. Many of the cases were treated improperly or not treated at all. By helping these kids and adults we change their path in life. Adults with ADD are more likely to develop depression. 70-90% of children with ADHD continue to experience significant problems in adulthood. Okay, so we know ADD and ADHD are undesireable and we want to get help without dangerous medications, so what can be done? Get a thorough neurological examination to determine if there are imbalances in the way the brain is firing. A revolutionary form of evaluation for the brain is the QEEG (brain map). QEEG’s are a safe, noninvasive, computerized evaluation of brain wave activity that literally creates a picture of what is happening in the child’s brain. As mentioned above, when the frontal lobes misfire it can create problems with focus. This type of deficit will often be observed on a QEEG as increased delta-theta wave activity in the frontal cortex. Based on the results of the neurological examination, the QEEG, and laboratory testing (when indicated) effective treatment parameters can be developed to support the child’s neurological health. The brain is plastic (moldable) and can change based on the environment and stimulation it is given. Doctors who use neurofeedback work to activate and strengthen the weak areas of the brain that have been identified in the examination process. Neurofeedback (NFB) is a form of behavioral therapy with more than 50 years of basic and applied research combining real-time feedback of brain activity with the scientifically established principles of operant conditioning to teach trainees how to self-regulate targeted aspects of brain functioning. In 2012 the American Academy of Pediatrics (AAP) recognized neurofeedback as being as effective as medication for Attention Deficit Hyperactivity Disorder (ADHD). The AAP evaluates the data and research that exists to determine what works and what doesn’t. This information is passed on to pediatricians so that they can better serve their patients. ”Best Support” indicates that the AAP has found that biofeedback is an effective treatment for ADHD and should be recommended as a primary option. Extinguish any persistant primitive reflexes. The nervous system develops in a sequential order. First, we are born with a set of primitive reflexes that help ensure our survival. Babies inherently know how to breastfeed or swallow for instance. We are sensory beings. We are dependent and develop by receiving input to our central nervous system through our senses (sight, smell, taste, hearing, touch, proprioception). Without sensory input the brain would have no output and would not operate properly. Just consider babies that are left alone without being touched. What happens to those children? As the central nervous system develops, the primitive reflexes are suppressed by 6-12 months of age allowing the vestibular system to develop so we can learn how to balance, while we are learning how to independently move our limbs/eyes/head. This sets the stage for more advanced movements such as upright posture and walking. Finally, all of this central nervous system (CNS) activity allows for development of higher cognitive function. If this order is hampered in any way, then we have a hard time continuing along the neurodevelopmental continuum. We literally become neurodevelopmentally stuck and unable to progress properly. If your child’s brain (hardware) has stalled along the developmental continuum it will become very apparent as they advance in school (adding new software). Reading may be difficult, math skills poor, and social development limited. Learning is like adding software to a computer. If the computer has the right hardware then you can add all the software you want and you’ll get proper function. If your child’s nervous system has not developed as it should, then schooling (adding data to their brain) will become very frustrating for all parties involved - teacher, student and parent. Be sure the microbiome is stong and varied. Researchers are finding a stong link between the health and variety of normal bacterial poplulations (microbiome) in the digestive tract and ADHD, as well as other neurobehavioral disorders. Many factors contribute to a healthy microbiome and conversly, an unhealthy one. Perhaps the best way to learn about this concept is reading Dr. David Perlmutter, MD's book on the subject, Brain Maker. In this book you will learn what the microbiome is, how it is developed and what can harm it. You will also learn what action steps to take, including foods to eat, to repair this second "brain". So, if you are looking for a drug-free strategy with plenty of clinical effectiveness, you just found one! My hope for you is that you or your child can grow, develop and prosper in life. For more details, read my Neurobehavioral White Paper for Parents, by clicking on the link below. For more details about the natural approach I take with my patients, take a look a the book I wrote entitled: Reclaim Your Life; Your Guide To Revealing Your Body's Life-Changing Secrets For Renewed Health. It is available in my office or at Amazon and many other book outlets. If you found value in this article, please use the social sharing icons at the top of this post and please share with those you know who are still suffering with neurobehavioral issues or other chronic health challenges, despite receiving medical management. Help me reach more people so they may regain their zest for living! Thank you! 2. The National Institutes of Health (NIH) is a biomedical research facility primarily located in Bethesda, Maryland, USA. An agency of the United States Department of Health and Human Services, it is the primary agency of the United States government responsible for biomedical and health-related research.